The new terminal will be able to handle up to 9 million additional passengers, After two years and an investment of nearly 2.5 billion pesos, on Tuesday, October 10, President Enrique Peña Nieto, with Governor Carlos Manuel Joaquín González and Fernando Chico Pardo, President and CEO of Grupo Aeroportuario del Sureste (Asur), will inaugurate the Terminal 4 (T4) of the International Airport of Cancun. 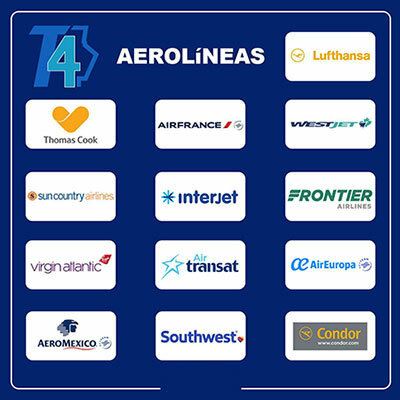 There are 14 airlines, national and international, which start operations as soon as Terminal 4 is launched: Aeromexico, Air Europa, Air France, Air Transat, Cóndor, Frontier Airlines, Interjet, Lufthansa, Southwest Airlines, Sun Country Airlines, Thomas Cook, Tomas Cook Scandinavia, Virgin Atlantic, and West Jet. Operate through the airport information campus 100% in common use, with an intelligence value, high energy efficiency, with Leed Silver certification, which offers an excellent quality of service to the users. Unfortunately the service of the MERA Business Lounge in Terminal 4 is not available at the time of opening. However, its integration in Terminal 4 has been scheduled as of March, 2018. Areas for food and beverage services.